Ray Weil, a professor and soil scientist at UM, and his graduate students study and promote tiller radish as a fall cover crop for farmers and gardeners. Here’s a photo of tiller radish (a.ka. forage radish or Daikon radish) interplanted with oats at the Central Maryland Research and Education Center in Clarksville. The large white storage roots grew to 8 inches in just 6 weeks-7 weeks. The radish roots “bio-drill” the soil which opens up large pore spaces and improves the structure of soils high in clay. soil structure. Both crops are killed by freezing temperatures leaving a mat of dead plant residues that help suppress weed growth in spring. 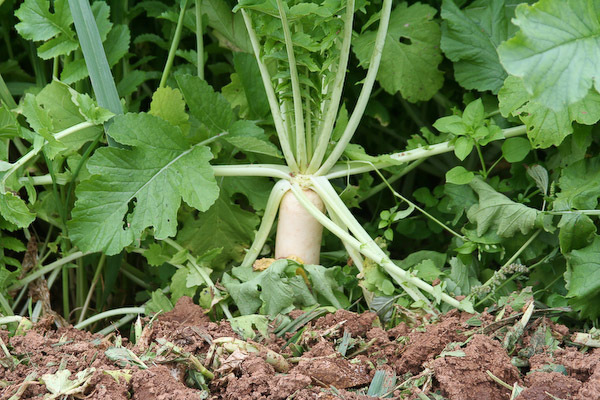 The radishes decompose rapidly leaving behind large pore spaces that increase air and water movement and biological activity, resulting in better root and plant growth next season. Two caveats: the tillage radish can provide a comfy late-season home for the harlequin bugs you battled on your fall kale, mustard, and broccoli. And if you plant a large area to these radishes you and your neighbors may detect a sulfur aroma as radishes rot in the soil. 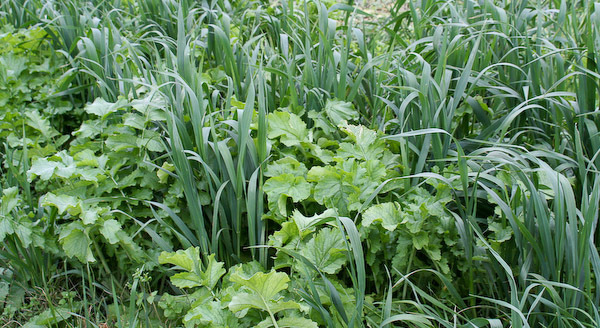 Still, this is an exciting new cover crop to try spring or fall.